Get Your FREE Web Presence Report Card! 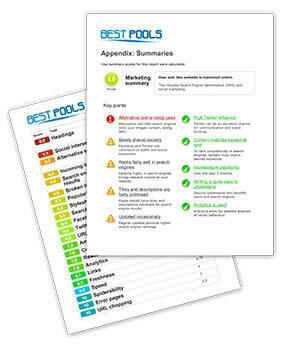 At The Pool Marketing Site, our mission is to help businesses find success in all areas of digital media marketing. That’s why we are giving away free advice on how to enhance your current digital marketing strategy. We will run 32 extensive tests on your website to see how your products and services are represented on the web as compared to your competitors. How well designed, built and mobile friendly is your website? What is the quality and volume of the content on your site? How well are you marketed online and on social media? If you’d like a free assessment, please fill out the form on the right and one of our marketing specialists will have all the information he or she needs to review your web presence before getting in touch!